Textbooks Africa collects and ships used textbooks, library books, computers and supplies to schoolchildren and teachers in Africa. We strive to inspire the minds of African children and assist in preparing them for the global challenges of the 21st century. Textbooks Africa offers several ways to support our mission. A contribution of $50 will send a box of books to a school in Africa; $200 will pay for documentation fees and $4,000 will cover ocean freight from the United States. Shipping and custom fees are our greatest expense. 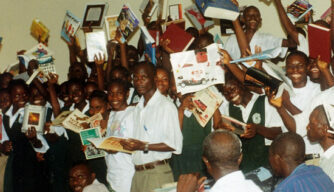 Photo: Teachers and students happy to receive books sent by Wede. This non-profit brings together two vital concerns: education and the environment. Textbooks Africa seeks to enlighten, inspire and educate the youngsters of Africa, many of whom are denied the basics of education because of ongoing armed conflict or the aftermath of such conflicts. Textbooks Africa recycles used textbooks, library books, computers and school supplies, promoting sustainable living and environmental responsibility. Click to support Operation Backpack. Web page was developed by students at St. John’s High School in DC.